How deep learning came to power Alexa, Amazon Web Services, and nearly every other division of the company. Amazon loves to use the word flywheel to describe how various parts of its massive business work as a single perpetual motion machine. It now has a powerful AI flywheel, where machine-learning innovations in one part of the company fuel the efforts of other teams, who in turn can build products or offer services to affect other groups, or even the company at large. Offering its machine-learning platforms to outsiders as a paid service makes the effort itself profitable—and in certain cases scoops up yet more data to level up the technology even more. It took a lot of six-pagers to transform Amazon from a deep-learning wannabe into a formidable power. The results of this transformation can be seen throughout the company—including in a recommendations system that now runs on a totally new machine-learning infrastructure. Amazon is smarter in suggesting what you should read next, what items you should add to your shopping list, and what movie you might want to watch tonight. And this year Thirumalai started a new job, heading Amazon search, where he intends to use deep learning in every aspect of the service. When will we begin to see more mainstream recommendation engines for learning-based materials? With the demand for people to reinvent themselves, such a next generation learning platform can’t come soon enough! Turning over control to learners to create/enhance their own web-based learner profiles; and allowing people to say who can access their learning profiles. AI-based recommendation engines to help people identify curated, effective digital playlists for what they want to learn about. Matching one’s learning preferences (not styles) with the content being presented as one piece of a personalized learning experience. From cradle to grave. Lifelong learning. Asynchronously and synchronously connecting with others learning about the same content. Online learning continues to expand in higher ed with the addition of several online master’s degrees and a new for-profit college that offers a hybrid of vocational training and liberal arts curriculum online. Inside Higher Ed reported the nonprofit learning provider edX is offering nine master’s degrees through five U.S. universities — the Georgia Institute of Technology, the University of Texas at Austin, Indiana University, Arizona State University and the University of California, San Diego. The programs include cybersecurity, data science, analytics, computer science and marketing, and they cost from around $10,000 to $22,000. Most offer stackable certificates, helping students who change their educational trajectory. Former Harvard University Dean of Social Science Stephen Kosslyn, meanwhile, will open Foundry College in January. The for-profit, two-year program targets adult learners who want to upskill, and it includes training in soft skills such as critical thinking and problem solving. Students will pay about $1,000 per course, though the college is waiving tuition for its first cohort. 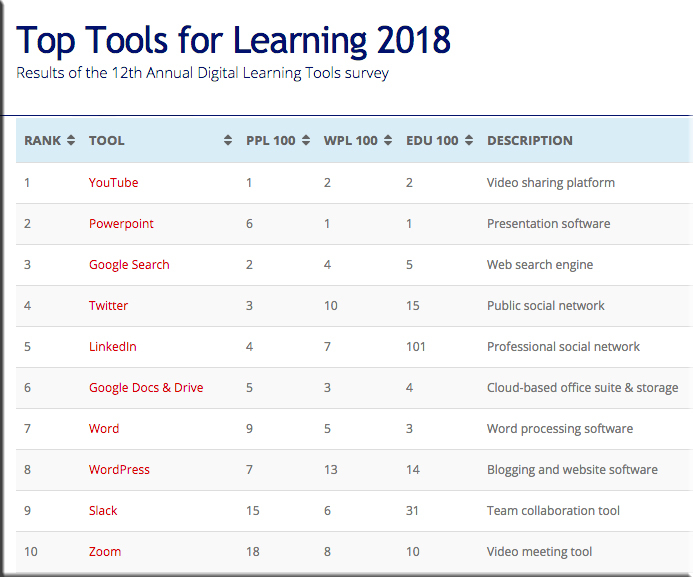 [On 9/24/18], I released the Top Tools for Learning 2018 , which I compiled from the results of the 12th Annual Digital Learning Tools Survey. Top 100 Tools for Personal & Professional Learning 2018 (PPL100): the digital tools used by individuals for their own self-improvement, learning and development – both inside and outside the workplace. Top 100 Tools for Workplace Learning (WPL100): the digital tools used to design, deliver, enable and/or support learning in the workplace. Top 100 Tools for Education (EDU100): the digital tools used by educators and students in schools, colleges, universities, adult education etc. 3 – Web courses are increasing in popularity. Although Coursera is still the most popular web course platform, there are, in fact, now 12 web course platforms on the list. New additions this year include Udacity and Highbrow (the latter provides daily micro-lessons). It is clear that people like these platforms because they can chose what they want to study as well as how they want to study, ie. they can dip in and out if they want to and no-one is going to tell them off – which is unlike most corporate online courses which have a prescribed path through them and their use is heavily monitored. 5 – Learning at work is becoming personal and continuous. The most significant feature of the list this year is the huge leap up the list that Degreed has made – up 86 places to 47th place – the biggest increase by any tool this year. Degreed is a lifelong learning platform and provides the opportunity for individuals to own their expertise and development through a continuous learning approach. And, interestingly, Degreed appears both on the PPL100 (at 30) and WPL100 (at 52). This suggests that some organisations are beginning to see the importance of personal, continuous learning at work. Indeed, another platform that underpins this, has also moved up the list significantly this year, too. Anders Pink is a smart curation platform available for both individuals and teams which delivers daily curated resources on specified topics. Non-traditional learning platforms are therefore coming to the forefront, as the next point further shows. 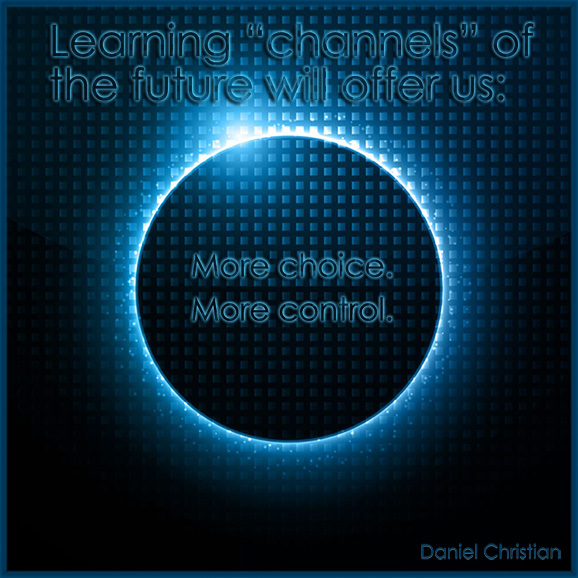 Perhaps some foreshadowing of the presence of a powerful, online-based, next generation learning platform…? When you can bring huge numbers of students together with lots of well-branded universities and global enterprises seeking a highly skilled workforce, could those linkages be strong enough to forge a new future for massive open online courses? Campus Technology: Coursera used to be a MOOC operator, but now it’s a tech company, an LMS company, a virtual bootcamp and more. So how are you describing Coursera these days? You have [traditional universities] teaching with some of the world’s best professors, with some of the most cutting-edge research, to a population of people who have sat right here in front of you, on a small parcel of land, and who pay a lot of money to do that. It’s been very high quality that’s been available to the very few. What we’re interested in doing is taking that quality of education and making it available to a vast group of people. When you think about our business model, I like to think about it as an ecosystem of learners, educators and employers. What we do is we link them together. We have 34 million learners from around the world. Our biggest country represented is the United States, followed by India, followed by China, followed by Mexico, followed by Brazil. A lot of the emerging markets and the learners there are coming to Coursera to learn and prosper. CT: Let’s talk about the University of Pennsylvania deal. Do you think that’s going to put some competitive pressure on the other Tier 1 schools to jump into the fray? Maggioncalda: This is a very well-regarded program. The University of Pennsylvania is a very well-regarded university. I think it’s causing a lot of people to re-evaluate what they were imagining their future might look like: Maybe learners really do want to have access that’s more convenient and lower cost and they don’t have to quit their jobs to take. And maybe there is literally a world of learners who can’t come to campus, in India and Europe and Latin America and Russia and Asia Pacific and China. In two years we’ve had over 1,400 companies hire Coursera to deliver university courses at work to their employees. “I’ve been predicting that by 2030 the largest company on the internet is going to be an education-based company that we haven’t heard of yet,” Frey, the senior futurist at the DaVinci Institute think tank, tells Business Insider. Along these lines, a lifelong learner can opt to receive an RSS feed on a particular topic until they master that concept; periodic quizzes (i.e., spaced repetition) determine that mastery. Once mastered, the system will ask the learner as to whether they still want to receive that particular stream of content or not. With the introduction of far-reaching and robust technology, the job market has experienced its own exponential growth, adaptation, and semi-metamorphosis. So much so that it can be difficult to guess what skills employer’s are looking for and what makes your résumé — and not another — stand out to recruiters. Thankfully, LinkedIn created a 2018 “roadmap”— a list of hard and soft skills that companies need the most. LinkedIn then coupled those specific skills with related jobs and their average US salaries — all of which you can find below, alongside courses you can take (for free or for much less than the cost of a degree) to support claims of aptitude and stay ahead of the curve. The online-learning options we included — LinkedIn Learning, Udemy, Coursera, and edX— are among the most popular and inexpensive. With college tuition soaring nationwide, many Americans don’t have the time or money to earn a college degree. However, that doesn’t mean your job prospects are diminished. Increasingly, there are many companies offering well-paying jobs to those with non-traditional education or a high-school diploma. Google and Ernest & Young are just two of the champion companies who realize that book smarts don’t necessarily equal strong work ethic, grit and talent. Whether you have your GED and are looking for a new opportunity or charting your own path beyond the traditional four-year college route, here are 15 companies that have said they do not require a college diploma for some of their top jobs. Several years ago when gas prices were sky high, I couldn’t help but think that some industries — though they were able to grab some significant profits in the short term — were actually shooting themselves in the foot for the longer term. Sure enough, as time went by, people started looking for less expensive alternatives. For example, they started buying more hybrid vehicles, more electric cars, and the sales of smaller cars and lighter trucks increased. The average fuel economy of vehicles went up (example). The goal was to reduce or outright eliminate the number of trips to the gas station that people were required to make. These days…I wonder if the same kind of thing is happening — or about to happen — with traditional institutions of higher education*? Are we shooting ourselves in the foot? Traditional institutions of higher education better find ways to adapt, and to change their game (so to speak), before the alternatives to those organizations gain some major steam. There is danger in the status quo. Count on it. The saying, “Adapt or die” has now come to apply to higher ed as well. Faculty, staff, and administrators within higher ed are beginning to experience what the corporate world has been experiencing for decades. Faculty can’t just teach what they want to teach. They can’t just develop courses that they are interested in. The demand for courses that aren’t attractive career-wise will likely continue to decrease. Sure, it can be argued that many of those same courses — especially from the liberal arts colleges — are still valuable…and I would agree with some of those arguments. But the burden of proof continues to be shifted to the shoulders of those proposing such curricula. I hope that this isn’t the case and that it’s not too late to change…but history will likely show that higher ed shot itself in the foot. The warning signs were all over the place. The current trends are paving the way for a next generation learning platform that will serve someone from cradle to grave. * I realize that many in higher ed would immediately dispute that their organizations are out to grab short term profits, that they don’t operate like a business, that they don’t operate under the same motivations as the corporate world, etc. And I can see some of these folks’ points, no doubt. I may even agree with some of the folks who represent organizations who freely share information with other organizations and have motivations other than making tons of money. But for those folks who staunchly hold to the belief that higher ed isn’t a business at all — well, for me, that’s taking things way too far. I do not agree with that perspective at all. One has to have their eyes (and minds) closed to cling to that perspective anymore. Just don’t ask those folks to tell you how much their presidents make (along with other higher-level members of their administrations), the salaries of the top football coaches, or how many millions of dollars many universities’ receive for their television contracts and/or their ticket sales, or how much revenue research universities bring in from patents and so on and so forth. TechCrunch report on how digital giants are buying into Last-Mile Training by partnering with Pathstream to deliver necessary digital skills to community college students. Most good first jobs specifically require one or more technologies like Facebook or Unity — technologies that colleges and universities aren’t teaching. If Pathstream is able to realize its vision of integrating industry-relevant software training into degree programs in a big way, colleges and universities have a shot at maintaining their stranglehold as the sole pathway to successful careers. If Pathstream’s impact is more limited, watch for millions of students to sidestep traditional colleges, and enroll in emerging faster and cheaper alternative pathways to good first jobs — alternative pathways that will almost certainly integrate the kind of last-mile training being pioneered by Pathstream. America’s colleges and universities could learn a thing or two from Leo, because they continue to resist teaching students the practical things they’ll need to know as soon as they graduate; for instance, to get jobs that will allow them to make student loan payments. Digital skills head this list, specifically experience with the high-powered software they’ll be required to use every day in entry-level positions. But talk to a college president or provost about the importance of Marketo, HubSpot, Pardot, Tableau, Adobe and Autodesk for their graduates, and they’re at a loss for how to integrate last-mile training into their degree programs in order prepare students to work on these essential software platforms. Enter a new company, Pathstream, which just announced a partnership with tech leader Unity and previously partnered with Facebook. Pathstream supports the delivery of career-critical software skill training in VR/AR and digital marketing at colleges and universities. Inside Higher Education Q&A on upcoming book A New U: Faster + Cheaper Alternatives to College. Last-mile training is the inevitable by-product of two crises, one generally understood, the other less so. The crisis everyone understands is affordability and unsustainable levels of student loan debt. The other crisis is employability. Nearly half of all college graduates are underemployed in their first job. And we know that underemployment is pernicious and lasting. According to the recent report from Strada’s Institute for the Future of Work, two-thirds of underemployed graduates remain underemployed five years later, and half remain underemployed a decade later. So today’s students no longer buy that tired college line that “we prepare you for your fifth job, not your first job.” They know that if they don’t get a good first job, they’re probably not going to get a good fifth job. As a result, today’s students are laser-focused on getting a good first job in a growing sector of the economy. This presents a challenge and an opportunity: How can we design online learning environments that achieve scale and intimacy? 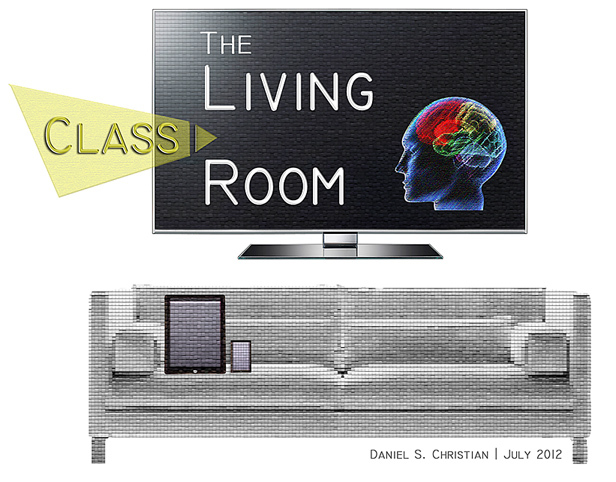 How do we make digital platforms feel as inviting as well-designed physical classrooms? The answer may be that we need to balance massiveness with miniaturization. If the first wave of MOOCs was about granting unprecedented numbers of students access to high-quality teaching and learning materials, Wave 2 needs to focus on creating a sense of intimacy within that massiveness. We need to be building platforms that look less like a cavernous stadium and more like a honeycomb. This means giving people small chambers of engagement where they can interact with a smaller, more manageable and yet still diverse groups. We can’t meaningfully listen to the deafening roar of the internet. But we can learn from a collection of people with perspectives different than ours. What will it take to get MOOC platforms to begin to offer learning spaces that feel more inviting and intimate? Perhaps there’s a new role that needs to emerge in the online learning ecosystem: a “learning architect” who sits between the engineers and the instructional designers. A learning ecosystem is a system of people, content, technology, culture, and strategy, existing both within and outside of an organization, all of which has an impact on both the formal and informal learning that goes on in that organization. The word “ecosystem” is worth paying attention to here. It’s not just there to make the term sound fancy or scientific. A learning ecosystem is the L&D equivalent of an ecosystem out in the wild. Just as a living ecosystem has many interacting species, environments, and the complex relationships among them, a learning ecosystem has many people and pieces of content, in different roles and learning contexts, and complex relationships. Just like a living ecosystem, a learning ecosystem can be healthy or sick, nurtured or threatened, self-sustaining or endangered. Achieving your development goals, then, requires an organization to be aware of its own ecosystem, including its parts and the internal and external forces that shape them. Yes, to me, the concept/idea of a learning ecosystem IS important. Very important. So much so, I named this blog after it. Each of us as individuals have a learning ecosystem, whether we officially recognize it or not. So do the organizations that we work for. And, like an ecosystem out in nature, a learning ecosystem is constantly morphing, constantly changing. We each have people in our lives that help us learn and grow, and the people that were in our learning ecosystems 10 years ago may or may not still be in our current learning ecosystems. Many of us use technologies and tools to help us learn and grow. Then there are the spaces where we learn — both physical and virtual spaces. Then there are the processes and procedures we follow, formally and/or informally. Any content that helps us learn and grow is a part of that ecosystem. Where we get that content can change, but obtaining up-to-date content is a part of our learning ecosystems. I really appreciate streams of content in this regard — and tapping into blogs/websites, especially via RSS feeds and Feedly (an RSS aggregator that took off when Google Reader left the scene). The article brings up a good point when it states that a learning ecosystem can be “healthy or sick, nurtured or threatened, self-sustaining or endangered.” That’s why I urge folks to be intentional about maintaining and, better yet, consistently enhancing their learning ecosystems. In this day and age where lifelong learning is now a requirement to remain in the workforce, each of us needs to be intentional in this regard. There isn’t a New York Times bestseller list for online courses, but perhaps there should be. After all, so-called MOOCs, or massive open online courses, were meant to open education to as many learners as possible, and in many ways they are more like books (digital ones, packed with videos and interactive quizzes) than courses. The colleges and companies offering MOOCs can be pretty guarded these days about releasing specific numbers on how many people enroll or pay for a “verified certificate” or microcredential showing they took the course. 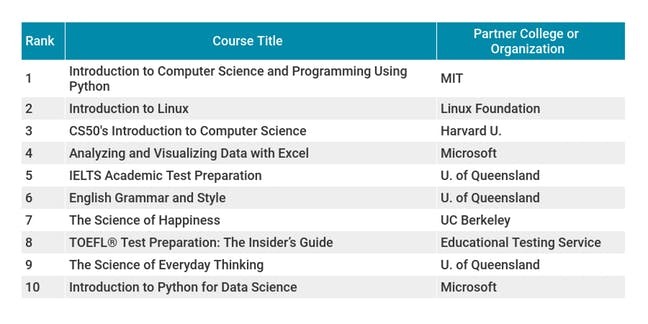 But both Coursera and EdX, two of the largest providers, do release lists of their most popular courses. 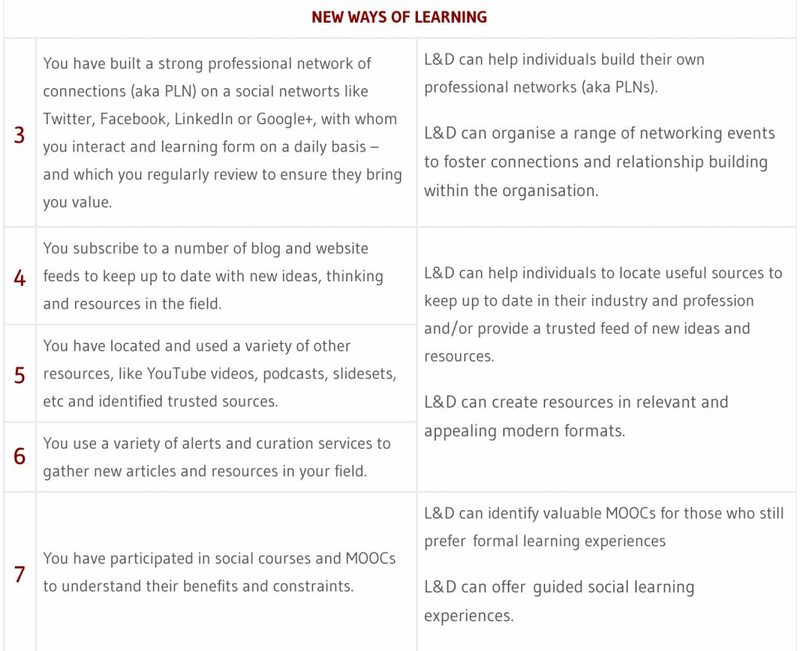 And those lists offer a telling snapshot of how MOOCs are evolving and what their impact is on the instructors and institutions offering them. So what are these blockbuster MOOCs, then? Experiential textbooks? Gateways to more rigorous college courses? A new kind of entertainment program? Maybe the answer is: all of the above. One selling point of MOOCs (massive online open courses) has been that students can access courses from the world’s most famous universities. The assumption—especially in the marketing messages from major providers like Coursera and edX—is that the winners of traditional higher education will also end up the winners in the world of online courses. But that isn’t always happening. 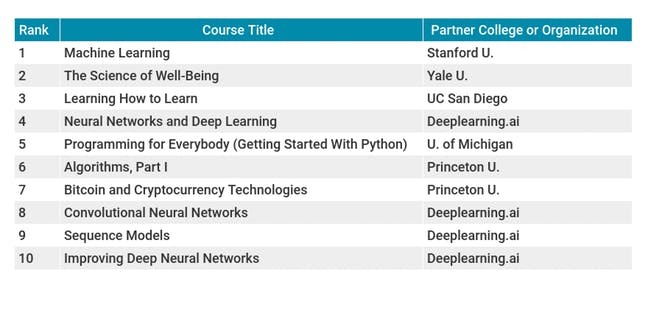 In fact, three of the 10 most popular courses on Coursera aren’t produced by a college or university at all, but by a company. That company—called Deeplearning.ai—is a unique provider of higher education. It is essentially built on the reputation of its founder, Andrew Ng, who teaches all five of the courses it offers so far. Ng is seen as one of the leading figures in artificial intelligence, having founded and directed the Google Brain project and served as the chief scientist at the Chinese search giant Baidu, as well as having directed the artificial intelligence laboratory at Stanford University. He also happens to be the co-founder of Coursera itself, and it was his Stanford course on machine learning that helped launch the MOOC craze in the first place. In fact, Ng’s original Stanford MOOC remains the most popular course offered by Coursera. Since the course began in 2012, it has drawn more than 1.7 million enrollments. (It now runs on demand, so people can sign up anytime.) And his new series of courses through Deeplearning.ai, which kicked off last year, have already exceeded 250,000 signups. Even allowing for the famously low completion rates of MOOCs, it still means that hundreds of thousands of people have sat through lecture videos by Ng.